Can you name a more exciting weekend to go into the holiday break with than a home-and-home meeting with the USCHO ranked No. 1 team in the country? If you’re having trouble, that’s because you may not be able to. Friday night will play host to a raucous People’s United Center crowd when the top ranked University of Massachusetts men’s ice hockey team (12-1-0, 7-0-0 Hockey East) skates into Hamden to take on the No. 8 Quinnipiac Bobcats (13-2-0, 6-2-0 ECAC Hockey). The last time these two met was November 24 and 25 of 2017 — a series in which UMass swept the Bobcats with a 2-1 win in game one and a 6-3 win in game two. The Bobcats are coming off a weekend sweep against Princeton in which they outscored the Tigers by a margin of 9-3 and extended their winning streak to six straight. Andrew Shortridge started in the first game, nailing the door shut with 20 saves in his second shutout of the campaign. Keith Petruzzelli manned the pipes in the second victory, turning away a total of 27 shots while allowing three goals. The Minutemen had just one game over the weekend, a matchup with in-conference opponent UConn. They won the game 7-4, registering as their ninth straight victory. UMass is fueled by contributions across the ice, with both forwards and defenseman helping out in the offensive effort. The team’s point leaders are sophomore forward Mitchell Chaffee, who has 10 goals and eight assists for a total of 18 points, and sophomore defender Cale Makar, a talented Colorado Avalanche draft pick who has six goals and 12 assists for the same number of tallies. There’s also their goaltender, Matt Murray, who has seen the majority of playing time and has amassed a 1.99 GAA with a sleek 9-0-0 record overall. 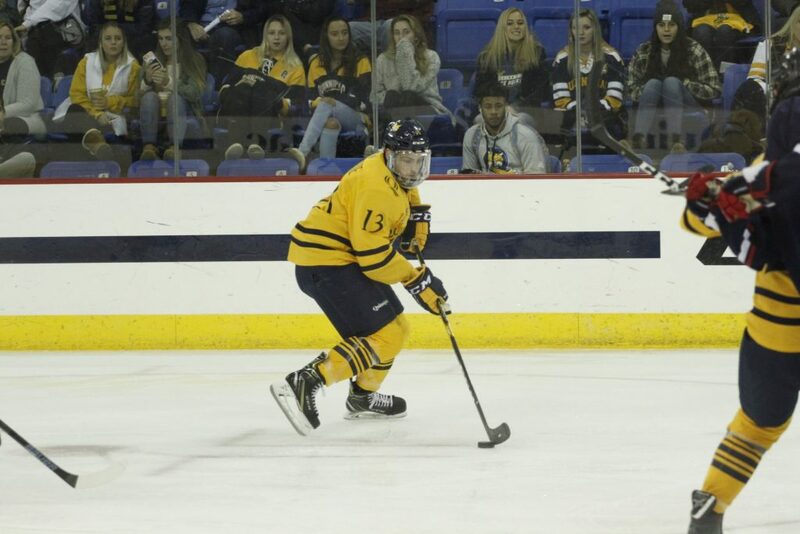 Quinnipiac has also seen helping hands from both forwards and defenders as well. Sophomore forward Odeen Tufto, who picked up six points over the weekend, currently sits at the top of the team’s point categories with 24, stemming from 10 goals and 14 assists. Team captain Chase Priskie has been ripping the ice apart this season with 11 goals and eight assists and has already had his name floated around for the coveted Hobey Baker Award. The Bobcats will be looking for revenge after getting swept last season but will be facing a formidable foe in the Minutemen. One thing is a given — it’s going to be a fun weekend of college hockey. Sharpen the skates and cue the Mo Bamba.